Cameron Lamour of the Sarnia Sting. Photo by Terry Wilson / OHL Images. The Sarnia Sting upset the Storm 6-2 in Guelph. The Sting led 1-0 after the opening period on Nick Grima’s third goal of the season. Guelph’s Nate Schnarr tied the game at 4:36 of the second period then Sarnia would score four unanswered goals. Jamieson Rees scored his tenth of the season at the 8:27 mark followed 25 seconds later by Justin McCombs’ third. With his team-leading 31st of the campaign Hugo Leufvenius made it 4-1 on the power play before Braden Guy notched his seventeenth 29 seconds later. The Storm would score their second goal 13 minutes into the second. Sean Josling, with his fourteenth, rounded out the scoring for Sarnia in the final frame. Sarnia associate coach Brad Staubitz liked what he saw on the ice. 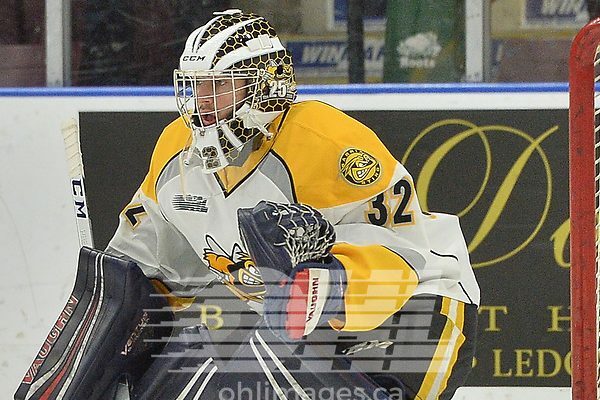 Cameron Lamour made 37 saves for Sarnia while Guelph’s Anthony Popovich and Nico Daws combined for 19 saves. In a rarity the Sting claimed all “three star” selections with Lamour first star followed by Rees and Franco Sproviero who collected two assists. The two teams square off again Saturday night at the Progressive Auto Sales Arena at 7:05 p.m. The pregame show starts at 6:35 p.m. on 103.9 FM – 1070 AM CHOK.